Matt Meyer of Ded Bugs. "If you would have told me in 1989 that my band would go on to release five albums, tour Japan, meet the Ramones and perform with the Dickies, I would have figured you completely mad, mad, mad," says Matt Meyer, guitarist and founding member of punk outfit Ded Bugs. To celebrate 25 years together, the band will play a string of anniversary shows, starting tonight at Plush Saint Louis with Rat Heart and Better Off Damned. "The initial impetus was 'fun first.' Primary ingredient: F-U-N. And that's still our mantra," Meyer says of the Ded Bugs approach to music. The band's chief export is a chuckle in the form of playful punk rock. And while Meyer might sport a laid-back attitude, the band has clearly cut its teeth on years of practice. One might say, "this ain't your dad's punk rock," but it clearly is. And that's a good thing. Ded Bugs knows the value of a catchy hook. While the songs tread familiar ground, the band knows when to run wild with riffs or lay off with ample space for vocals. And that skill comes in handy with three lead singers howling at a quick pace. Past albums titled We Ended Up Having To Eat Each Other! and Sugar Coated Snot Pops For Kids! sum up the lyrical content -- a comic book musical come to life. Ded Bugs was most active from 1993 to 2004, releasing music on cassette, CD and seven-inch records. And although the last full length Stop and Smell the Stinking Corpse Lillies dropped ten years ago, Ded Bugs just keeps going like a zombie, hungry for ears craving pop-punk. "Nothing much has changed in Ded Bugs. We're older. But we didn't get fat. And we didn't decide to become banjo-death-core and/or wear neon pink parkas with matching vinyl boots sponsored by Always," Meyer adds. Tonight at Plush, Ded Bugs will perform its 2004 album in its entirety for the first time live. For the past two years, Meyer has mentored Million Hits, a young five-piece with a median age of thirteen. As Ded Bugs made the many mistakes of rock & roll past, Meyer felt fit to impart tips on how to operate, such as releasing a DIY album and making sure the band gets paid. "My friend Jeremy Wallace phoned and said, 'Matt! My son Eli is playing drums in a band. I think they sound great, but I have no musical training whatsoever. I play the radio, that's it. Will you come to a rehearsal and let me know what you think?' So I dropped in on a rehearsal then gave him some modest feedback," Meyer explains how he fell into his role as mentor. Recently he stepped back and let Million Hits take the reins. Meyer seems more focused on the future of punk rock than his own endeavors. Read on as Matt Meyer fills in the blanks on his favorite aspects of St. Louis. Oh, and his hatred for hippies. 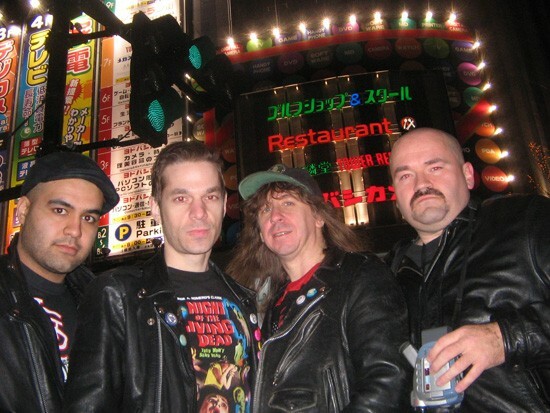 Matt Meyer (second from the left) and the rest of Ded Bugs on the streets of Japan. Matt Meyer, guitarist of Ded Bugs. What I like most about St. Louis is... Lots. But just to name a few: It's a nice place to visit for a DeSotonian. It's not too big, not too small. Thee mighty Mississippi and the Arch and all the magnificence and history attached to each. KDHX. Lotsa good eats -- places like Crown Candy. Very strong arts community. Three of the four distinct seasons: Blossoms/storms in spring, turning leaves in fall, snow in winter (let's not talk about summer!) It's the best baseball city in the world. Its rich rock 'n roll history. Vincent Price. What I like most about DeSoto is it's a sleepy little railroad town. Very quiet (except when we're rehearsing) and you can see a basquillion stars in the sky when you come home from a gig at three in the morning. I make music because... it's my No. 1 passion. I continue to make music because I've seen, first-hand, its remarkably positive effect on other humans, except for that time in grade school when little Georgie Bumpus attacked Ms. Winnie when she tried to teach us a Phil Collins song. I'm most productive when... I'm focused on an interest and not focused on being productive. The best post-show food in St. Louis is... whatever sounds good -- usually junky or breakfast food. I've had a power bar or a protein shake after a show, but more often it's tacos or pizza (if I'm with a group) or a boston creme donut or a peanut butter-topped waffle or blueberry pancakes. The most difficult lesson I've learned while playing music is... to check the grounding of a microphone before you decide to sing into it. Being a human lightning rod may sound fun, but in reality, it is not. Also, very important: Don't feed the hippies. They will come crawling back, smelling up your back yard with patchouli and littering it with Birkenstocks, lava lamps and Phish CDs from the 1990s. Nobody wants that. If this unfortunate scenario happens, do "Mother Earth" a favor, "man." Rent a bulldozer and put hippie garbage in its proper place: six-feet under on your meanest neighbor's property. The St. Louis music scene could use... The STL Punk Page resurrected! Facebook hates bands. 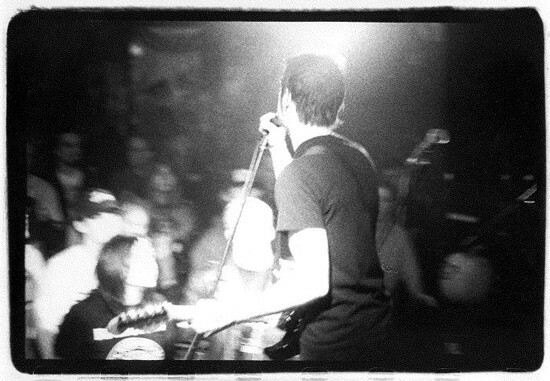 MySpace liked bands, but it wasn't the same as good old STL Punk. Somebody get Jerome Gaynor on the horn post-haste! Follow Ded Bugs through its official website and Facebook page.